A paradigm shift in Libya could be on the horizon as the son of slain Libyan leader Muammar Gaddafi, Saif al-Islam Gaddafi, confirmed that he will run for president of Libya in 2018. Tripoli, Libya – After spending the last six years incarcerated by a militia in the wake of the systemic destruction of Libya by NATO-backed forces in 2011, the second son of slain Libyan leader Muammar Gaddafi, Saif al-Islam Gaddafi, confirmed that he will run for president of Libya in 2018. Through family spokesman Basem al-Hashimi al-Soul, Gaddafi confirmed to Egyptian television that he plans on running in what will likely be a tenuous election in the highly fragmented state. “Saif al-Islam Gaddafi, the son of the former Libyan president, enjoys the support of major tribes in Libya so he can run for the upcoming presidential elections due in 2018. Saif al-Islam plans to impose more security and stability in accordance with the Libyan geography and in coordination with all Libyan factions”. Since Gaddafi was freed in June, he has been touring Libya to build support among the nation’s numerous tribal factions. Libya remains a failed state in the wake of the 2011 NATO regime change operation. Saif Gaddafi was once the heir apparent of the Libyan regime, a London School of Economics graduate touted as a modernizer who mixed with British high society. Although the publicly stated reason for the imposition of French-led U.N. Security Council Resolution 1973, which created a no-fly zone over Libya, was the express intent of protecting civilians, one of the over 3,000 new Hillary Clinton emails released by the State Department on New Year’s Eve 2015, contained damning evidence of Western nations using NATO as a tool to topple Libyan leader Muammar al-Gaddafi. 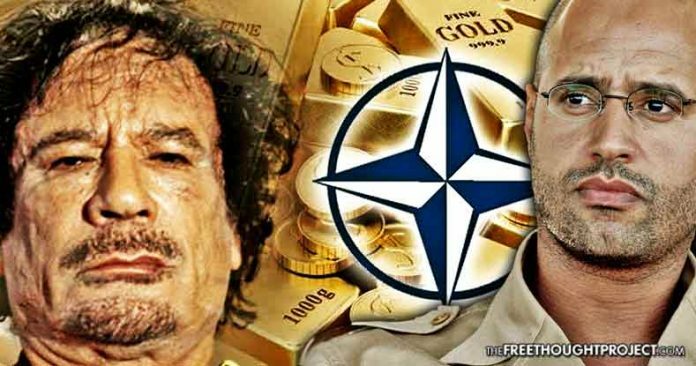 The emails expose that the NATO-backed regime change operation was not for the protection of the Libyan people, but instead to thwart Gaddafi’s attempt to create a gold-backed African currency to compete against the Western central banking monopoly. The emails indicate the French-led NATO military initiative in Libya was also driven by a desire to gain access to a greater share of Libyan oil production, and to undermine a long-term plan by Gaddafi to supplant France as the dominant power in the Francophone Africa region. The April 2011 email, sent to the Secretary of State Hillary by unofficial adviser and longtime Clinton confidant Sidney Blumenthal with the subject line “France’s client and Qaddafi’s gold,” reveals predatory Western intentions. Most astounding is the lengthy section delineating the huge threat that Gaddafi’s gold and silver reserves, estimated at “143 tons of gold, and a similar amount in silver,” posed to the French franc (CFA) circulating as a prime African currency. The email makes clear that intelligence sources indicate the impetus behind the French attack on Libya was a calculated move to consolidate greater power, using NATO as a tool for imperialist conquest, not a humanitarian intervention as the public was falsely led to believe. This gold was accumulated prior to the current rebellion and was intended to be used to establish a pan-African currency based on the Libyan golden Dinar. This plan was designed to provide the Francophone African Countries with an alternative to the French franc (CFA). NATO’s imperialist adventurism has subsequently left Libya a failed state, locked in a perpetual multi-dimensional power struggle, without a single unifying government. Saif Gaddafi plans to reunify the fragmented country, similar to what his father before him did in 1969. However, after years of imperialist meddling, there are numerous factors that could significantly impede his plans. The current power struggle reveals multiple factions vying for dominance. At present, the leading factions are the broadly pro-western Government of National Accord in Tripoli and the Egypt backed and generally Russia friendly Libyan House of Representatives in the eastern Libyan city of Tobruk. The strongest armed forces in Libya and frankly the only united one, is the Libyan National Army led by House of Representatives loyalist Khalifa Haftar. By contrast, the fledgling Government of National Accord is constantly besieged with a rival Tripoli faction, the National Salvation Government, while all forces are battling (or in the case of the Tripoli factions, failing to battle) terrorists associated with al-Qaeda, the Muslim Brotherhood and ISIS. Resurrecting Libya as any kind of state is a monumental order. In a few short years, a NATO war turned Libya from a wealthy, united state with high standards of living and near-universal literacy to an open air terrorist training camp, built on top of a failed state. Thus far, the only signs of salvation have come in the form of military victories by Haftar’s Army which has successfully cleansed Benghazi of many terrorist forces. The problem however is that while Haftar’s Libyan National Army has found success, the Libyan House of Representatives for whom he fights, has struggled to put forward a cohesive nation wide political programme. Subsequently, Saif Gaddafi’s entry into the political fray could drastically change the calculus on the ground as he enjoys a popular support that far exceeds that of the Western-backed Government of National Accord, which coincidentally, doesn’t recognize the amnesty granted to Gaddafi by other competing factions. Interestingly, similar to the modern paradigm, prior to Muammar Gaddafi’s 1969 revolution, Libya was an economically dysfunctional state, run by local tribes that had little interest in the creation of a unified country. This tribalist Libya was ruled by King Idris until his eventual overthrow by a young Col. Gaddafi in 1969. After Gaddafi took power from Idris, life in Libya changed drastically, as modernity, world-class healthcare, public wealth, irrigation to the desert and technological amenities became available to the masses. Sadly, since the imperialist NATO intervention in 2011, Libya has returned to the dark ages as murder, violence, and instability have become the norm. As TFTP has reported, we have even seen the reemergence of slavery in the region where human beings are being bought and sold in broad daylight. Some feel that because of his pedigree and family legacy, Saif al-Islam Gaddafi could serve as a unifying figure in the country. Libya observers believe that Saif Gaddafi could benefit from the general weariness of extreme fragmentation and nostalgia for the relative stability of the Gaddafi era. Saif’s lawyer and public representative, Khalid al Zaidi noted Saif’s ability to reunite Libya in a recent public statement. Saif al-Islam Gaddafi’s entry into the political field is likely precipitated by the December 17 expiration of a tenuous UN agreement designed to maintain a semblance of national unity. If there is no agreement between the factions to amend and extend the agreement, there are fears that the current most powerful military figure, General Khalifa Haftar, head of the Libyan National Army (LNA), which holds sway in the east, will seek to capture Tripoli, and oust the UN-backed prime minister, Fayez al-Sarraj, and his Government of National Accord (GNA). Haftar has backing from Egypt, Russia and the United Arab Emirates (UAE). The UN-brokered Libyan agreement, signed on December 17, 2015, established Libya’s Government of National Accords (GNA) for a one-year period, which could be renewed only once. The UN position is now that the agreement, which aimed to unite the country’s warring factions, is still in full effect until a new agreement is adopted. But Haftar, who backs a rival administration in the east, rejected the statement, according to Al-Jazeera. “The 17th of December has arrived and brought with it the end of the so-called Skhirat agreement,” Haftar, who never recognised the authority of the GNA, said in a televised appearance on Sunday night. “Therefore all institutions created by this agreement are void,” he added. Libya remains divided between the GNA in Tripoli, led by Prime Minister Fayez al-Sarraj, and a Haftar-backed administration in the east. This could create a perfect storm for Saif Gaddafi’s entry into Libyan politics. Saif would likely have to deal with Haftar, especially as Haftar’s support could be crucial in what would pass for an election in post-NATO Libya. Khalifa Haftar was once a loyal officer in Gaddafi’s Libya but in the late 1980s, during the war with Chad, he fell out with Gaddafi and ran to the US where he became an American citizen. Upon returning to Libya, his secular political programme, proven military skill and his backing by secular Egypt, has made him a moderate in a failed state undulating between various Takfiri extremes. It is not clear how Saif al-Islam would be able to work with a man who was viewed as a failure and traitor by his father, but it would be almost impossible if two men with a theoretically similar political programme for Libya could not at least attempt to work together in some capacity. While Libyan society is extremely fragmented, with virtually no sign of a unified state, the potential for Haftar and Gaddafi to reunify the Libyan nation certainly exists. Will Saif Gaddafi stand up against the western powers that murdered his father over Libyan oil and gold, or will he suffer the same fate as his father due to imperialist intervention in Libya? Could a Gaddafi-Haftar alliance secure the future of the once prosperous African nation?